Samaritan's Purse volunteers are busy in the Houston area after recent floods. 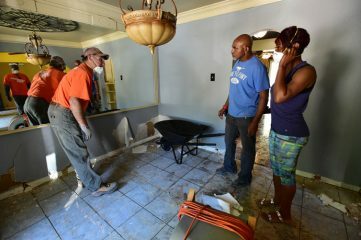 Wilford and Tangela Simpson knew early on April 18 that the sandbags around their doors wouldn’t hold. The water in their kitchen was ankle deep. By 10 a.m. they struggled pointlessly in thigh-high water to salvage their car on four jacks. By 2 p.m. they were loading their daughter and four foster kids onto a neighbor’s personal watercraft. Soon after, the Simpsons left their dream home to the mercy of the 100-year flood. Samaritan’s Purse helped the Simpsons after their home flooded. What forecasters predicted simply as heavy rain ended up dumping 17 inches on the city within 24 hours. A 17-inch downpour equals about 240 billion gallons of water—the equivalent of 88 hours of liquid flowing over Niagara Falls. This was Houston’s second wettest day on record. As with so many other Houston homeowners, the Simpsons didn’t have flood insurance, and they were uncertain how to begin to find their new normal. When Samaritan’s Purse assessors showed up in their front lawn a day later, Wilford experienced a new kind of shock. As word spreads about our work in the flood-affected areas of Houston, work orders and volunteer teams are growing. 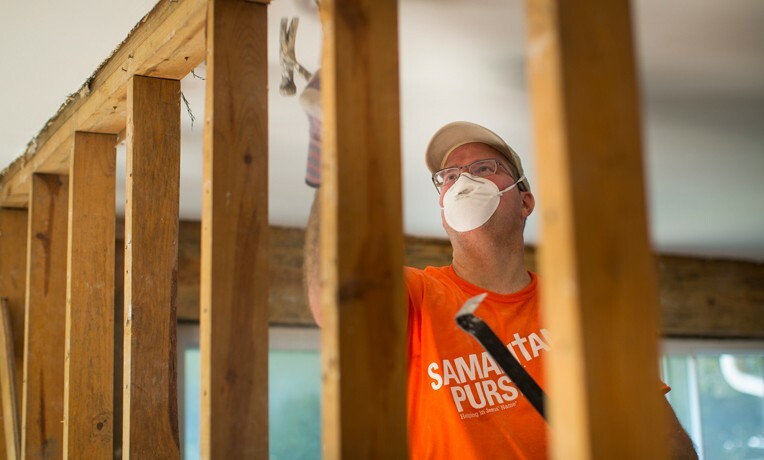 Samaritan’s Purse is working alongside The Woodlands Church—our base church—and other Houston-area churches to clear homes of debris and remove compromised walls and flooring. So far, more than 330 veteran and first-time volunteers have come from the surrounding area and from out of state to assist Houston homeowners in Jesus’ Name. If you drive through Houston today under sunny skies, it looks like life has returned to normal. But if you talk to people like the Simpsons or like Donna Thompson in Hockley, Texas, who trudged two miles through floodwaters to reach high ground, you realize the recovery for thousands in Houston is far from over. 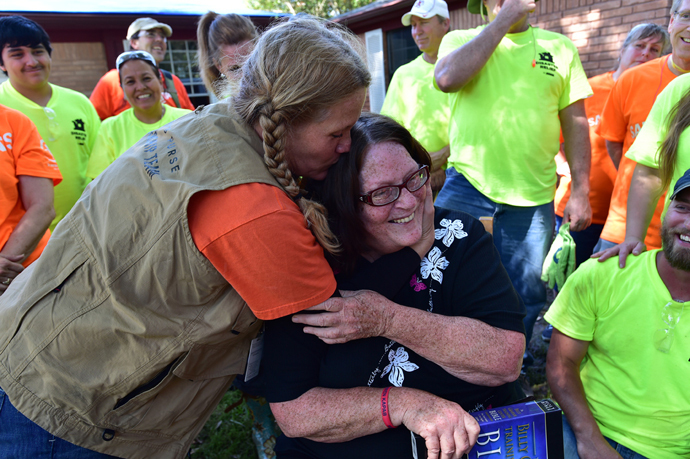 Samaritan’s Purse Site Team Leader Leslie Meinen hugs her mother Donna Thompson. We worked on Donna’s home this weekend and presented her a new Bible. Please continue to pray for homeowners and for our teams in Houston. In addition to our Houston deployment, we have ongoing responses in Orange County, Texas, and in West Monroe, Louisiana, both pummeled by the same March storm system. Our successful and fruitful deployment in nearby Bossier City, Louisiana, has been completed. Between these three deployments that started in March, we have helped over 320 homeowners and 95 individuals have received salvation in Jesus Christ.